Arvidsson, Maria. En handskrifts tillkomst- och brukshistoria. En närstudie av Cod. Holm. A 49 (Nådendals klosterbok). Uppsala 2017. Samlingar utgivna av Svenska fornskriftsällskapet, Serie 1, Svenska skrifter 101. viii + 264 pp. 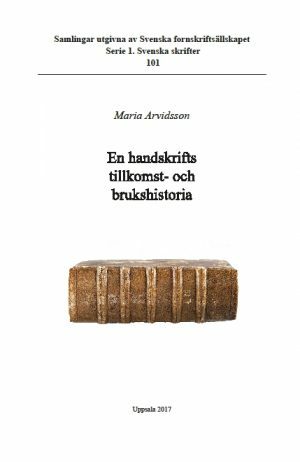 ISBN 978-91-979881-5-5.
parts of the manuscript were written (Vadstena or Nådendal) and by whom they were read and used (female or male religious communities). A number of theoretical and and methodological questions are discussed: crucial for the analyses are in particular the concepts of production unit (produktionsenhet) and multitext book (multitextbok). Plans for “Nådendals klosterbok” were laid out at Vadstena Abbey, probably with the female house intended as the primary recipient. However, some production units point towards the male house. The fact that the manuscript may have been meant for use in both communities could explain its fairly late binding (after the dissolution of the male monastic community in the middle of the sixteenth century.) In a context of book-loaning between the houses it would have been logistically advantageous to have the texts in smaller units. Keywords: The Birgittine Order, Medieval miscellaneous manuscripts, Old Swedish literature, Nådendal (Naantali) Abbey.